Two key initiatives credited with providing some fresh energy to the iconic 44-year-old event were the launch of the Creativate Digital Arts Festival and the move of the Standard Bank Village Green craft market to a new home. However, the credit for driving audiences into the city’s theatres must go to the carefully curated programme and the wide choice of acts. Clearly, it’s working—a post-event survey found that 82% of respondents said they would return in future years. The National Arts Festival CEO, Tony Lankester, and the Executive Producer Ashraf Johaardien, share some behind-the-scenes insights. What is the importance of the National Arts Festival? What would we stand to lose if it ceased to exist? TL: The NAF is a national treasure—it is the only set of stages in the country where all artists can converge to present their work. Older, established performers with long track records are on the same programme as young, hungry artists at the start of their career. It is that magical convergence that gives the festival its edge and that feeling that the programme is packed with moments of magic waiting to be discovered. For a country such as South Africa, which is in dire need of a common identity, it is a place where we can meet to learn and understand about what makes us similar and what makes us different—and to celebrate and explore both. The festival is the very embodiment of this notion of social cohesion, which is not about making a single, homogenous society, but rather about creating a society where we all understand and are genuinely empathetic towards the worlds of our fellow South Africans. The National Arts Festival has witnessed a great deal of change since its inception. Would you say that its mandate has remained consistent, and been consistently delivered upon, throughout the years? TL: Yes, absolutely. One of the secrets of the festival’s longevity is that consistency. When it started, as is still true today, it was a platform for free speech, where everyone was welcomed. Throughout the Apartheid years, it was a place where audiences and artists could mix freely. That spirit still pervades the festival—a totally non-cynical environment where everyone is respected and discovery is the currency of our audiences. The festival is held in a town whose name has recently changed. What significance does this change hold for you? TL: Context is important so, yes, we acknowledge the pain and incongruity of an event that has our values and vision being located in a city that commemorated its colonial past through its name. Similarly, we are addressing the issue of the name of the building from which we operate. We don’t own the building but we have recently embarked on a process of consultation and discussion that will see a new name and purpose for the building—hopefully before the 2019 festival takes place. As much as the NAF is a national institution, it also has to turn a profit. From a business point of view, how has it fared in recent years? How is the festival perceived by potential sponsors as a business proposition? What efforts have been made to improve this perception? TL: We have been operating in a tough environment: not only has the recession impacted on how readily available corporates sponsor the arts, but we know the multiple pressures bearing down on the public purse. Our government has many priorities—infrastructure, healthcare, education and so on—and in that environment, something takes a back seat. Sadly, that is often the arts. And so, like most non-profit organisations, we have to constantly navigate the ebbs and flows of funding. Fortunately, the festival brand is strong and, through relationships like the ones we have with Standard Bank and the Eastern Cape Government, we’re able to achieve a fair level of stability. What are your criteria for success and in those terms, how well did the festival do this year? TL: Attendance figures are obviously an important marker for the overall health of the festival. But success is also measured in other, less tangible ways: anecdotal reports from local businesses; standing ovations in our theatres; foot traffic through our craft market and our many exhibitions and galleries. By most measures, we had a good year and we’re seeing the strong brand and reputation of the festival carry us through a period where there is less disposable income and more pressures on the wallets of our audiences. What were some of your personal highlights in terms of goals achieved, expectations exceeded, challenges overcome, and so forth? TL: Seeing the sun rise on the first day of the festival every year is always a highlight for me —as is the first morning after a successful festival. Just ticking the funding box each year and then seeing this event come to life, staging thousands of performances in a way that transforms our city and creating experiences that our artists and audiences will remember for a lifetime all make this a job that is a constant highlight. How is the programme put together? How can aspiring artists participate? TL: The festival is a year-long cycle. We call for submissions for our main programme for the following year—almost exactly as the current festival comes to an end. This window for submission is open until around the end of August, after which there is a lengthy process of consideration from the Artistic Committee. The main programme is chosen by this team, together with the Executive Director. We open the call for submissions for the fringe of the festival in October. The Fringe is free from solicitation or creation and is a truly open space for anyone who wishes to perform to do just that. 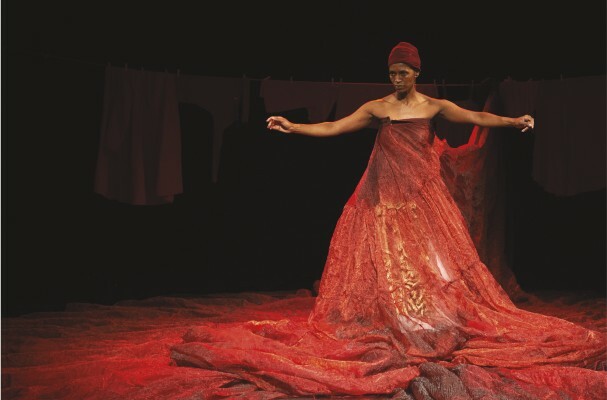 In between is the arena programme, which is a selection of works that have been recognised by a Standard Bank Ovation Award. There is also a student theatre element and a film festival and, more recently, we also introduced Creativate, a space where technology and creativity meet. What sort of risks have to be taken in selecting acts? AJ: The festival is a legacy project, which has built up a loyal audience since its inception. That audience has come to expect high production values and works of a certain standard. At the same time, the festival has a reputation for launching careers and profiling new artists. So, there is an inherent tension here between giving audiences what they want and staying ahead of the curve by programming untested work and artists who are perhaps not yet recognised or established. What efforts are made to ensure that the programme is democratically representative? AJ: It’s really quite simple: we ensure that the voices around the table, which either influence or are responsible for programming choices, are as diverse as our artists and audiences. To this end, we have also implemented a practice or rotating genre curators on the artistic committee every two to three years. A common criticism of the festival is that it is elitist and white, especially in terms of who can afford to travel and attend shows. Is that a false perception? TL: That’s not a criticism we’ve heard for a few years, so I think we have definitely seen a shift in this regard. I would venture that our audiences are the most mixed of any festival in South Africa. In terms of accessibility, yes, travelling to Grahamstown, staying here for a few nights and buying tickets come at a cost, but this is true of any sustained wide-scale festival (have you tried getting a hotel room in Cape Town during the International Jazz Festival?). Thus, instead, we focus on the things we can influence/change, and our mission in Grahamstown is to make theatre and the arts accessible to as many people as possible throughout the year, not just at festival time. Sure, during the festival, we distribute over R300 000 worth of tickets to local community groups, we stage dozens of free performances across the city for people to access, and we are constantly focused on doing more for our local community. But we also do other things: run a choral festival in March every year; run a series of regional schools festivals across the country; host movies in the Monument every weekend; and display the work of local visual artists in a dedicated year-round gallery in town. To what extent do regional businesses (eg. game ranches) and the local government support the festival? What opportunities do you feel are not being sufficiently exploited? TL: We know—from the research conducted by the Rhodes Department of Economics—that the festival stimulates the provincial GDP by some R377 million. The benefits are felt primarily by the tourism and hospitality sector. I think there is still scope for further growth—accommodation providers, a hotel group, transport and shuttle providers. In terms of creating jobs, we already employ significant numbers of locals. The festival employs about 414 people directly—more than 70% of whom are from Grahamstown. Of the people we employ, about 80% have no other income throughout the year. So, the festival is a lifeline for a lot of people and is one of the city’s biggest employers of local residents. What were the most popular or commercially successful acts of 2018? What were the most critically acclaimed acts? Is there a discrepancy between these two categories? TL: Yes, there is often a discrepancy. A lot of what the festival does, particularly on the main programme, is about the art and not about selling lots of tickets. One of our most successful shows this year was ‘The Doghouse’, which had a maximum seating capacity of five audience members per performance. Even though it was sold out virtually every performance, clearly it’s not a big money spinner. What influence, if any, has #RhodesMustFall had on the NAF? TL: It’s had no direct influence, although, obviously, it is a theme and concern that pervades much of the work on our programme. One notices that in addition to the annual festival projects the NAF has a number of additional projects that are not confined to the Eastern Cape, ranging from the Cape Town Fringe to—excitingly—the recently announced Sharjah Fringe. Please could you expand on what these opportunities mean for the NAF as a brand and as a business? TL: The strategy behind such initiatives is that we want to use our core expertise to diversify our revenue stream; to create work opportunities for our staff, particularly the freelancers and temp staff we employ; and to fulfil our mission of increasing access to the arts by running great festivals. The Sharjah Fringe is more about exporting our expertise and deriving management fees, which then come back to Grahamstown to support our core business here and contribute to our ability to do what we do in Grahamstown. What is the nature of the National Arts Festival, as a commercial entity? What is its corporate structure? Are there any ways for interested parties to invest? TL: We’re registered as a non-profit company (NPC), so any surplus each year stays in the business to enhance what we do or to cushion against any year where we might make a loss. Obviously, we’ll never say no to investment but it would need to be into one of our commercial activities—our ticketing business, for example, or into one or another of our more commercial projects.